Bo the Portuguese Water Dog made headlines when he became Barack Obama's presidential pooch. If you're curious about Bo's background and what made him a good fit for his new family, you'll enjoy the following interview with the American Kennel Club (AKC) Director of Club Communications, Lisa Peterson. LoveToKnow (LTK): Regarding the Obamas, do you feel that they held true to their desire to adopt a rescue dog? Lisa Peterson (LP): Yes, it would be difficult for the Obamas to rescue a dog from a shelter because they required a specific breed and coat type due to their daughter's allergies. Working with a breeder or purebred rescue group to find a rehomed dog was a great option for them. An advantage of purebred dogs is that they are predictable. You will always know what you're getting in regards to coat type, size, activity level, temperament, etc. 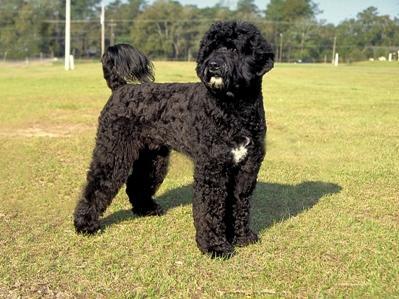 In the case of the Portuguese Water Dog (PWD), the breed is smaller in number and therefore bred primarily by responsible breeders. There are typically not many PWDs available in rescue at any given time. Bo's breeders took him back when his original home did not work out (a hallmark of responsible breeders) and rehomed him with the Obamas. LTK: Will the PWD's characteristics fit with a busy family like the Obamas? LP: Yes, the PWD is an outgoing, active, confident dog that will be able to handle a busy environment. Bo appears to have been well-socialized and exposed to many different people and experiences before moving in with the Obamas, so with continued training, he should be able to fit in well with the Obama family. However, PWDs need regular attention, so someone else will need to continue with training and exercise when the Obamas are busy. LTK: What is Bo's background? LP: Bo is registered with the AKC as Amigo's New Hope (part of his breeders' "Hope and Change" themed litter). He was bred by Art and Martha Stern, long-time breeders who reside near Dallas, TX, and is a littermate of Senator Ted Kennedy's pup Cappy. According to reports, he was placed with a family in the D.C. area, but the family's older dog did not appreciate his puppy antics. The Sterns took him back and rehomed him with the Obamas. LTK: What type of training will this dog have? Before moving in with the Obamas, Bo lived with his trainer Dawn Sylvia-Stasiewicz. We expect that he was taught the basic "puppy kindergarten" commands, such as sit, down, come, stay as well as how to walk on a loose leash. The Obama family will have to work with him on a daily basis to reinforce what he has already learned and to continue building his skills. Continued socialization, or exposing Bo to as many new people and experiences as possible, is also important - especially when living in such a busy place as the White House. We encourage Bo to go through the S.T.A.R. Puppy Program, and to get his Canine Good Citizen certification as well! LTK: Did the Obamas forget to do anything in their thorough search for the right dog? LP: No, we were very impressed with the time they took to research a breed that fit with their lifestyle, and then their search to find an individual dog that would mesh with their family. Dogs are a lifetime commitment and not something to be purchased on a whim. We followed the Obamas' search at PresidentialPup.com. LTK: What type of upkeep and care will Bo, and PWDs in general, need? LP: Bo, like all dogs, will require yearly vet check-ups. He should be kept up to date on vaccinations, flea and tick prevention and heartworm medication. He should be fed a high-quality dog food. He will need daily vigorous exercise - long walks or a safe place to run - as well as obedience training. And of course, his coat will need up-keep including weekly brushing and occasional bathing and clipping. LTK: Are these easy to care for dogs for families? LP: PWDs are great family dogs, but their coat and exercise needs make them higher-maintenance than smooth-coated, less active breeds. LTK: Are PWDs a good choice for families with allergies? LP: Yes, PWDs tend to be a good choice for families with allergies. They shed a little bit, but they are single-coated, so they do not have an undercoat that sheds, and this is normally what people have problems with. They are considered hypoallergenic, but will still produce allergens - although less than other breeds due to their coat type. People with severe allergies are encouraged to spend time with adult members of the breed. Just because PWDs are considered "hypoallergenic" does not mean that all allergy sufferers will be unaffected. LTK: How can allergy sufferers get ready for a puppy in their home? LP: Measures that help include removing carpets, heavy drapes and upholstered furniture that trap dander. Washing pet beds often and grooming your dog frequently also helps. Also, do not let the pet sleep on the bed of an allergy sufferer. Allergy sufferers should also spend time with various adult dogs of the breed that interests them to see if the dogs affect their allergies. LTK: What other breeds are good for people with allergies? LP: Visit the AKC's Dogs and Allergies page to learn more about other hypoallergenic breeds and why they are ideal for allergy sufferers. LTK: What should always be the first step when searching for the right dog for a family? LP: Families should make a checklist of the characteristics they're looking for in a family pet, taking size, activity level, age (puppy or adult), grooming needs, temperament/intelligence, male vs. female, costs of raising the breed, etc. into account. They can then read about different breeds on our website to see which breeds match up with their requirements. You can find more information on AKC's The Right Dog for You. LTK: What else would people like to know? LP: When a famous person or celebrity gets a dog, that breed often jumps in popularity. We would like to remind people that although the dog may look cute and cuddly, they are not getting the entire picture about the dog's exercise, grooming and attention needs. Information about all 161 AKC-recognized breeds is listed on our website at AKC.org. It's important to learn about the characteristics of the breed you're considering. Lisa Peterson is the Director of Club Communications for the American Kennel Club. 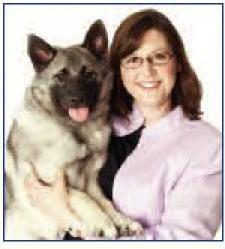 She has been an owner, breeder and handler of purebred dogs for 25 years and has won numerous awards for her beautiful Norwegian Elkhounds. Her communications expertise includes 20 years as a writer, newspaper reporter and columnist for AKC. Because of her extensive experience, she has also made numerous television appearances. LoveToKnow would like to thank Lisa Peterson for taking time out of her busy schedule for this interview to share her insight on dog ownership and about Bo the Portuguese Water Dog.